Hannabery HVAC - Why Us? Great Service, Fair Prices, Quality Installations! Known for our great service, fair prices, quality installations and friendly staff, Hannabery HVAC offers a scope of services designed to keep your comfort to a maximum and your costs to a minimum. So why else should you consider us for your HVAC needs? 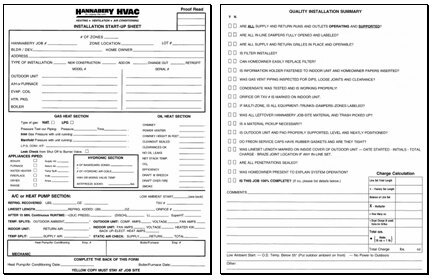 A detailed Start-up Sheet is filled-out, front and back, for every installation!